Today I decided it was time to rip off the bandage both literally and figuratively and take a good look at my new plug-in accessory. As you can see in the headline photo of this post, it mostly just looks like gross bruises, swelling and redness. 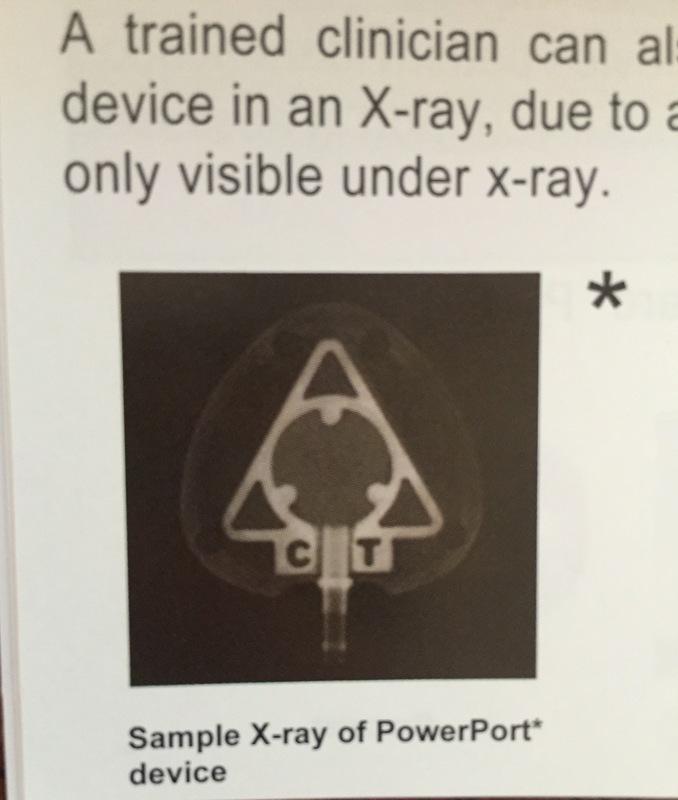 In paging through the pamphlet for my new Power Port, however, I came across this small image depicting what the port would look like under an x-ray. Veeerrrryyy interesting… Under an x-ray, my new cyborg feature contains the shape of a triangle with a circle in the middle. To conspiracy theorists, this symbol is unmistakable. It is the Eye Of Providence, or the ‘all seeing eye of God’ that is widely known to be the secret symbol of the famously secret society-the Illuminati. For those of you who were in a coma in 2003 and missed Dan Brown’s wildly popular DaVinci Code, The Illuminati is an alleged ‘secret society’ of intellectuals and scientists thought to have been in existence in Europe as far back as Galileo in the 17th century and has current ties to such modern day luminaries as Jay Z (Am I being sarcastic? You may never know). Now listen, I know that I have a special proclivity towards the highbrow, but I had no idea that I was even being considered to be a member of the Illuminati. To say that I am surprised to have been selected as a part of this highly esteemed group of scholars and dignitaries would be an understatement. The fact that Jay Z and his Illuminati henchmen went to such lengths to infect me with cancer in order for me to subversively get implanted with the cryptic and magical symbol is incredibly humbling. I am chosen, you guys. What will I do with my new Illuminati status? Well, the options are limitless. Maybe I will discover the key to eternal youth? Perhaps I will create a media empire that will make Time Warner look like Napster? I am even considering finding a cure for cancer, as that is the vehicle (and burden) by which I have my new magical powers. With great power comes great compromise and, in my case, I have to get through the ‘cancer’ part of the initiation before I look ahead to any major projects. I will probably just use my newfound power to go about my regularly scheduled programming. Cancer (elite membership in a hundreds of years old secret society), has sent me back to basics. You all know by now that I miss exercising. Outside of all of the obvious benefits, exercise afforded me alone time, time away from the routine of home. I need that time to focus on myself. I get to zone out, and just focus on whatever physical activity I am doing at that moment. I don’t have to think about which kid just peed their pants. It is an important escape. I woke up this morning, put on my workout clothes like I always used to do, and went to the gym. I just did it. Didn’t ask for medical clearance, didn’t waste time weighing the pros and cons. I just went. And it felt fantastic. Boxing with no arm involvement is peculiar, but my abs, glutes, hammies, etc. were all pretty dang stoked to be dusted off. I felt like me. Me and my trainer, and more importantly, friend, Casey. This gorgeous 23 year old bundle of joy always brightens my day. PS- This is definitively the strangest position my body has ever attempted. PPS- Casey made me flex- that was not my idea. Now that I have been initiated into the ultimate secret society, I have to look even more carefully at my level of influence. Until now, Grancer has been feeding the minds of some 30,000 people who have visited my blog. What comes next, to bring about a new world order, is between me and Jay. Previous Post Do You Think I Have Enough Ice Packs? Guilty of being in a coma, in 2003. The whole illuminati reference went over my head, but if your new status comes with super powers, I’m all in favour of it.